What ever were they thinking? Just two weeks after I passed my driving test at 16, my parents agreed—albeit reluctantly—to let me drive from our home in Canada to Daytona Beach in Florida for the annual spring break from school. I drove straight through the night, stopping only for fuel, Mars bars, and Orange Crush. And every single local AM radio station along the way was playing the Eagles’ “Hotel California.” To this day, I can recite the lyrics without even thinking. I loved that drive, the challenge of so many miles in such short time, the constantly evolving landscape, the progress from below-zero Canadian temperatures to 75°F in South Carolina. This was proper traveling. Yikes. A tough call, but at least the Northeast would present lots of easy wins: New Hampshire, Rhode Island, and Delaware are relatively tiny states that can be covered in short order. It’s the big ones —Tennessee, Virginia, Georgia came to mind—that would present the real challenge, and navigation would be the key. Photographer Greta Rybus proves to be a brilliant course plotter, a regular Christopher Columbus. She’s pretty handy with a camera, too. Unlike my earlier foray, we’d be doing this journey in the enveloping comfort of the Mazda6, with a super-smooth-shifting six-speed automatic and a powerful 2.5-liter 16-valve four-cylinder engine. 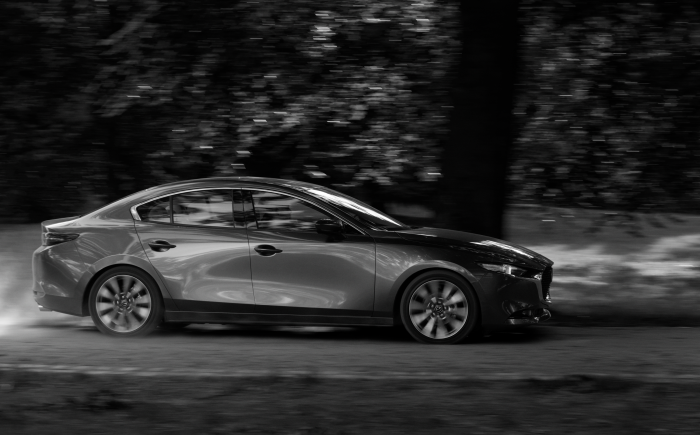 Fuel economy and superb refinement are a must for such a big journey and the Mazda has both in spades. And just as I had all those years ago, I’d do all 24 hours behind the wheel. This was a selfish ploy, I’ll admit, because I have the navigational skills of a house brick and so reckon that I’d be better off as wheelman. We decide on a safer option by breaking the 24 hours into two 12-hour days. We set out on Day 1 from Portland, Maine, joining that same I-95 that took me to Florida all those years ago. It’s the longest north–south highway in the U.S. and one of the oldest in the country. It carries us deep into our journey, past Baltimore, and on toward Virginia, where we pick up the I-81 for our first overnight stop in Winchester. We take a little detour before going to Winchester so that we can tick the West Virginia box. Just inside the border, we pay a flying visit to Harpers Ferry. It’s a beautiful and historic little town that sits at the confluence of the Potomac and Shenandoah rivers. It’s also where the states of Maryland, Virginia, and West Virginia meet—Harpers Ferry is in such a strategic location that it changed hands no less than eight times during the Civil War. Rolling, rolling, rolling. The U.S. interstate highway system is still one of the most efficient ways to get around: cruising at the speed limit, we dispatch hundreds of miles painlessly. Loading up on peaches, bananas, granola bars, and plenty of water, we talk travel, politics, family, and cars we have loved. And for those quiet times, Greta’s brought along some fabulous podcasts—if you’re planning a mega drive, these are a must-have. Another must-have is an excellent sound system, which our Mazda6 has in the guise of Bose audio with no less than 11 speakers. “Hotel California” never sounded better. We make it to Winchester with just a few minutes left on the 12-hour timer on my phone. So on Day 1, we’ve managed to hit 12 states in 12 hours: Maine, New Hampshire, Massachusetts, Rhode Island, Connecticut, New York, Pennsylvania, New Jersey, Delaware, Maryland, Virginia, and West Virginia. Day 2 proves more of a challenge as we’re heading to the much larger southern states. Greta’s navigating chops get a real workout. We head southwest out of Winchester toward Kingsport, Tennessee, where we chow down at the Broad Street BBQ on some most excellent hot dogs, barbecued pork, and fries. Then we plot a due south course, just clipping North Carolina at Asheville. Greta’s routing means that we are able to dive into Georgia through Tallulah Falls and then track directly east into South Carolina. By the time we reach Greenville in South Carolina, we haven’t burnt all of our 12 hours, but we don’t have enough time to make another state line. Still, we are pleased: in a bit less than 24 hours, we have traveled through 16 states over a distance of just under 1,255 miles (with some detours). And then we have our reward: with no need to run against the clock on our return journey, we make our way to Maine on back roads, seeing the America that lies beyond these isolating four-lane super highways. So we head north on Day 3. Our first detour is Fishers Orchard, a sprawling peach orchard that boasts 25,000 trees over 250 acres. The most delicious smell of peaches washes over me as I climb out of the car and walk over to the stand to meet Jimmy Tooley, purveyor of peaches. He’s a model of Southern manners, with the “Yes, sirs” and “Yes, ma’ams” coming at every turn. The peaches are delicious. With ground to cover, we point the Mazda6’s nose north again. This car is a superb choice for this trip. Quiet, smooth-riding and with punchy performance when I need it, the 6 also manages a respectable 34.8 mpg average over our journey. But for sheer will-you-look-at-that vistas of otherworldly natural beauty (seriously, I’m not overselling this), you need to go to the Blue Ridge Parkway. It borders the Great Smoky Mountains and the Shenandoah national parks, and rambles for some 469 miles. There are panoramas that offer up mountains that march to the horizon like silk-screened artwork. It’s very special. But it’s foot-down time as we’ve got to make Maine on Day 4 of our adventure. We do, though, find time to check out the Jersey Shore. Such a nice surprise to find gorgeous, golden sandy beaches and perfect blue water so close to New York City. The locals call it the “Irish Riviera” and it stretches for 90 miles to Cape May in the south. And the tans! Who knew it was possible to get that brown? And then, inevitably on a Friday afternoon, we encounter monster traffic jams, as the entire population of New York seems to be heading north toward Maine. We make it as far as Kennebunkport, just as the sun is diving below the horizon. The place is overrun with tourists and as we cruise the main drag, we hear Johnny Cash cover tunes wafting out of an Irish pub. We head out of town along the coast, the tangy smell of seaweed coming through my open window.